hances are, not one American in 20 ever heard of a 2-cent piece. On an episode of "Who Wants to Be A Millionaire" with Regis Philbin a few years ago, the contestant faced the million-dollar question: "Which denomination was the first to show the motto, ŒIn God We Trust?'" Of course, he didn't know, and took his $500,000. The 2-cent piece came into being in 1864 partially to offset the severe shortage of 1-cent coins, and was a part of the Act of April 22, 1864, that created the small bronze cent in that year. From 1856 to 1864, the cent was a copper-nickel alloy slightly thicker than the present-day cent. 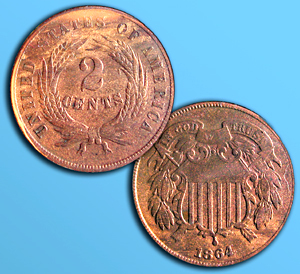 The 2-cent coin, designed by noted Mint Engraver James B. Longacre (who also designed the Indian head cent), featured a shield with a ribbon and the motto above on the obverse ("heads" side), and a wreath on the back with the numeral "2" in the middle and "cents" beneath the 2. From the start, this coin saw little use, and its initial mintage of 19 million during the first year slowed in each successive year until 1872, when the last circulation strikes were made. In 1873, only a small number of collector specimens were struck  estimated at 1,100 coins. In 1864 there were two varieties. The first was the "small motto," which is the scarcer of the two motto varieties; in average used condition, it catalogues for $65. In mint condition its value exceeds $1,000. The more common "large motto" variety is valued at $12 in used condition and more than $100 in mint condition. In each year the mintages dropped: 1865, 13 million; 1866, 3.17 million; 1867, 2.9 million; 1870, 861,000; 1871, 721,000; and 1872, only 65,000. In each year there are one or more recognized die varieties such as doubled dies, recut dates, doubled mottoes and various styled numerals in the date. Most are worth more than the more common types listed in the standard catalogues. The specialty books on the subject by Flynn (1994) and Kliman (1977) describe these varieties. Complete mint-condition sets are seen for sale from time to time and were a popular investment item years ago. Today's value for a mint-condition set of the 12 coins  10 different dates and two varieties  would run about $5,000 to $7,500. A circulated set of all 12 coins in lesser grades would run about $1,500 to $2,000. For a conversation piece, a 2-cent coin would certainly get people's attention. They did circulate well into the late 1800s and were totally gone from use by the early 1900s. For a small investment of under $20, you can find a nice, circulated specimen, mount it in a suitable coin holder, and carry it around as a "show and tell." Or you can send your fourth grader to school with it. The kids (and teacher) would get a real charge. You certainly can get "your two cents' worth" out of this obsolete coin.